Vivien Leigh and Marlon Brando. Don’t they seem to be dancing? 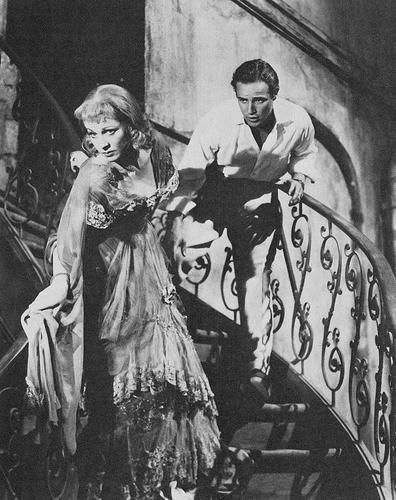 One of Tennessee Williams’ most powerful plays, A Streetcar Named Desire (1947), became a movie (directed by Elia Kazan) that earned various Oscars at the time – a raw, heart-wrenching and desillusioned affair… and an absolute must-see! Two choreographers did a great job translating it to dance: Neumeier for Marcia Haydée and Stuttgart Ballet, in 1983, and Annabelle Lopez Ochoa, working together with movie director Nancy Meckler, for Scottish Ballet (2012). Neumeier play is in Stuttgart’s regular repertoire (scheduled next in May, 2015), and an item in my wish-list! There was some dismissive nose-wrinkling, once more, on these kind of story-telling ballets, “a lesser kind of dance art”… If Tennessee Williams’ were to write a play equivalent to a ballet without narrative, it would be made of meaningless sequences of beautiful words… and THIS should be some kind of “higher art”? Oh, spare me! < Previous Natalia Osipova’s Awards – Is anyone surprised? Next > Ivan Vasiliev’s arms – Once more.